Today’s episode of Investing in Real Estate is sponsored by Handy! Handy is the easy and convenient way to book home cleanings on a schedule that works for you. To get your first 3-hour cleaning for $39 when you sign up for a plan, visit http://handy.com/investing and use promo code INVESTING during checkout. 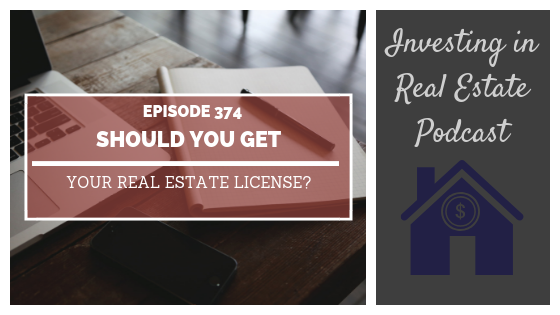 Should real estate investors get a real estate license? This is one of our most frequently asked questions, and today we’re calling in an expert to get to the bottom of it! On this episode of Investing in Real Estate, I’m sitting down with Tom Cafarella, the owner and broker of Cameron Real Estate Group. Tom has had a long and successful career in the real estate industry, and on today’s show he’s sharing some of his best tips and insights! What the market is like where Tom invests. How Tom got inspired to invest in real estate. Why being rich is a mindset. The importance of accounting for rental increases over time. What Tom considers the best types of rental properties. Tips for creating effective marketing materials. The types of sellers Tom targets. How investors and real estate agents can work together. The tax benefits of becoming a real estate professional. EP354: Are You Getting Your Advice From Rich People?